The growing field of peacebuilding has tried to mitigate interethnic conflicts by creating various sorts of dialogue programs, aiming to build social bonds and bridges between individuals from groups with a history of violent interaction. Yet, little is known of the effect of dialogue initiatives on interethnic relations and peacebuilding. Previous research on dialogue programs has suffered from the serious problem of selection bias: in other words, by not having comparable control groups it has not been possible to separate selection effects (that a program attracts certain types of people) from process effects (that programs have an effect on people). 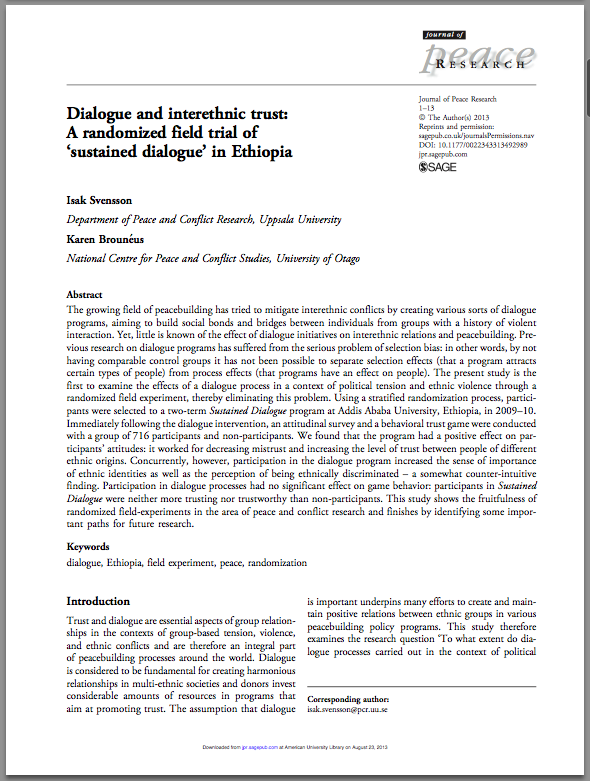 The present study is the first to examine the effects of a dialogue process in a context of political tension and ethnic violence through a randomized field experiment, thereby eliminating this problem. Using a stratified randomization process, participants were selected to a two-term Sustained Dialogue program at Addis Ababa University, Ethiopia, in 2009–10. Immediately following the dialogue intervention, an attitudinal survey and a behavioral trust game were conducted with a group of 716 participants and non-participants. We found that the program had a positive effect on participants’ attitudes: it worked for decreasing mistrust and increasing the level of trust between people of different ethnic origins. Concurrently, however, participation in the dialogue program increased the sense of importance of ethnic identities as well as the perception of being ethnically discriminated – a somewhat counter-intuitive finding. Participation in dialogue processes had no significant effect on game behavior: participants in Sustained Dialogue were neither more trusting nor trustworthy than non-participants. This study shows the fruitfulness of randomized field-experiments in the area of peace and conflict research and finishes by identifying some important paths for future research.